Dragass (also known as Tragoszcz, Dragasz, Tragas, Dragaß; now known as Dragacz; coordinates: 53.50566 N, 18.73899 E [53° 30' 20.4" N, 18° 44' 20.3" E]; population in 1852, 510, in 1910, 489, in 2012, 610), was a former Mennonite village near Gross-Lubin, Schwetz district, on the left shore of the Vistula River in Polish Prussia. Dutch Mennonites settled there in the 17th or even 16th century. Szper, Felicia. Nederlandsche nederzettingen in West-Pruisen gedurende den poolschen tijd. Enkhuizen: P. Bais, 1913: 134-135. Zijpp, Nanne van der and Richard D. Thiessen. "Dragass (Kuyavian-Pomeranian Voivodeship, Poland)." Global Anabaptist Mennonite Encyclopedia Online. September 2012. Web. 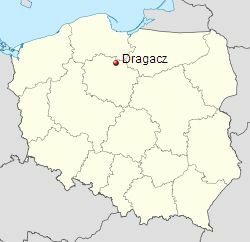 26 Apr 2019. http://gameo.org/index.php?title=Dragass_(Kuyavian-Pomeranian_Voivodeship,_Poland)&oldid=133498. Zijpp, Nanne van der and Richard D. Thiessen. (September 2012). Dragass (Kuyavian-Pomeranian Voivodeship, Poland). Global Anabaptist Mennonite Encyclopedia Online. Retrieved 26 April 2019, from http://gameo.org/index.php?title=Dragass_(Kuyavian-Pomeranian_Voivodeship,_Poland)&oldid=133498. Adapted by permission of Herald Press, Harrisonburg, Virginia, from Mennonite Encyclopedia, Vol. 2, p. 97. All rights reserved. This page was last modified on 9 February 2016, at 06:51.